Tejinder Pal Singh Bagga said Rahul Gandhi should reconsider his decision to nominate Kamal Nath as Madhya Pradesh chief minister. Tejinder Pal Singh Bagga started his hunger strike at Tilak Nagar in west Delhi. A Delhi BJP leader on Monday sat on an indefinite hunger strike against Kamal Nath being nominated for the Chief Minister's post in Madhya Pradesh, alleging that the Congress leader was involved in the anti-Sikh riots. Mr Nath will be sworn in as chief minister of Madhya Pradesh on Monday. 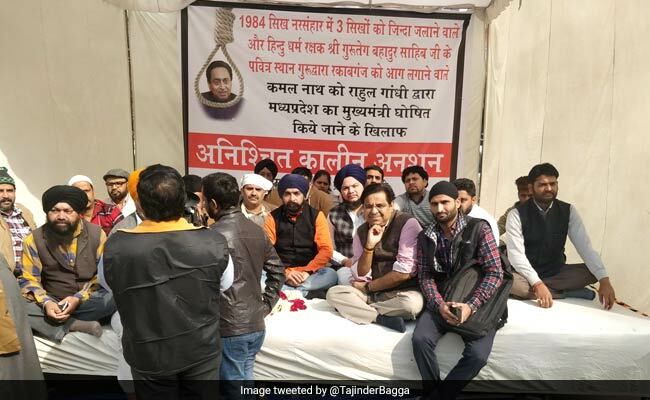 Tejinder Pal Singh Bagga started his hunger strike at Tilak Nagar in west Delhi where several families affected in the 1984 anti-Sikh riots live. Protesting the Congress's move in selecting Mr Nath for the chief minister's post, he said, "I am sitting on an indefinite hunger strike against Rahul Gandhi's decision to nominate him as CM. He (Nath) is the same person who was involved in the riots against Sikhs in Delhi." He said his hunger strike will continue till Mr Nath is replaced by someone else as chief minister of Madhya Pradesh. Several BJP leaders are supporting Mr Bagga's protest. BJP leader and Leader of Opposition in the Delhi Assembly Vijender Gupta said the Congress has "hurt" Sikh sentiments by appointing Nath as chief minister.